DOB: August 01 1856 Booroondara Vic. Games: 140 approx; plus 4 State games, and 2 Rugby matches. "George Coulthard looms large in the football records of the eighties, when he was for years the best all round player for Carlton. He could not be misplaced. His clever handling, his pace, his expertness in dodging, his sureness in the air, and his masterful kicking were items proved invaluable to his team. He was the brightest star in the galaxy, such as does not, even today, shed it's effulgent beams on Carlton". From top anti-clockwise. 1. J. Cordner (B - Bendigo? ), 2. J. Shaw (Hotham), 3. A. McIntyre (Melbourne), 4. A. Alexander (Williamstown), 5. A. Shearwood (Fitzroy), 6. S. Elms (South Melbourne), 7. G. Smith (Carlton), 8. A. B. Berry (Ballarat), 9. J. Lyons (South Ballarat). Note: Without viewing the original, some guess work was necessary in the naming of players and teams. "National v North Carlton was won by the former, who secured one goal, kicked by G. Coulthard." If this is the George Coulthard he would have just turned 17. The book "Origins of Austalian Football" has G. Coulthard listed in the 1874 Carlton team squad and says he was recruited from Carlton Imperials. Coulthard scored 1 goal for Carlton Imperial (firsts) v East Melbourne at the University Reserve. Perhaps the first superstar of Australian Football (or Victorian Rules as it was then known), George Coulthard joined the fledgling Carlton Football Club as a 19-year-old in 1876. A local farmer, Coulthard had already established himself as a brilliant cricketer. But when he donned the blue cap of Carlton and ran out to join in the game that had gripped the colony like no other, Coulthard was a sensation. Blessed with all the attributes of a champion, he was said to have speed, grace and near-perfect balance. ‘He is the grandest player of the day. It is doubtful if, for general excellence, his equal has ever been seen;’ said one newspaper of the day. He was named Champion of the Colony in his debut year of 1876, then won the game’s highest individual honour again in 1877 and 1879. 1878 Coulthard acted as umpire for the Melbourne Grammar vs Geelong Grammar schools match on the St. Kilda ground on Friday August 23. 1878 G.Coulthard was the leading Carlton goal scorer with 18 goals. "Now before going into club details, a word or two regarding players who have been conspicious during the season may not be out of place, and there can be no two opinions as to who is entitled to first mention - George Coulthard, of Carlton. Back, forward, or following, and nowhere out of place, the grandest player of the day, it is doubtful if for general excellence his equal has ever been seen in Victoria." Coulthard scored 21 goals for the 1879 season which was 2 more than the entire Hotham team scored! 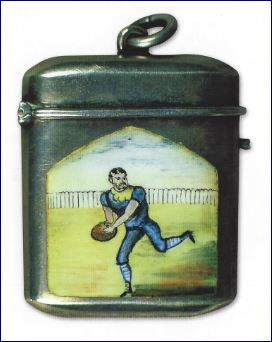 1880 Coulthard, again the top goal kicker for Carlton equalled last season's tally with 21 goals for the season. 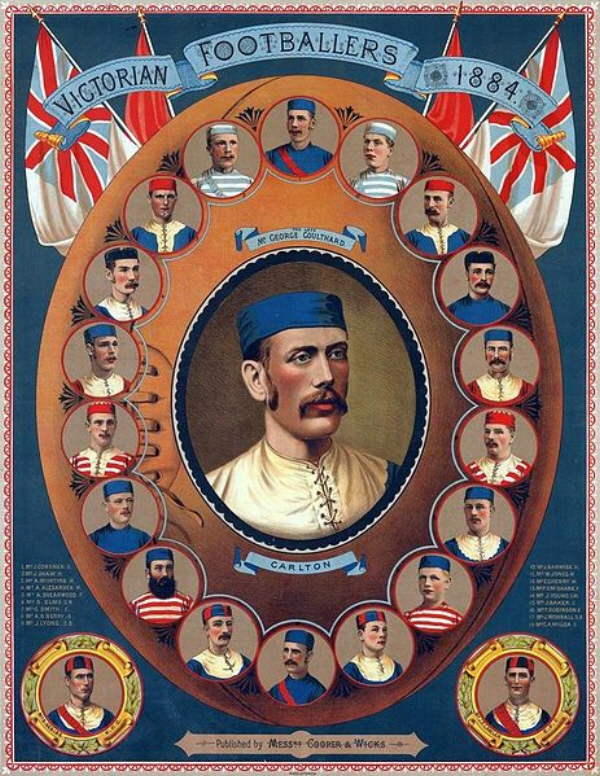 Combining football and cricket in alternate seasons, Coulthard represented Victoria in the summer game in 1881 and 1882. He did so well that he was called into the Australian team for the Second Test against England at the SCG in the summer of ’81/82. Meanwhile, his football career was on hold. Earlier that same year, Coulthard had been reported for striking a Hotham United (later North Melbourne) player Joseph 'Joey' Tankard, and suspended for the rest of the season. Sadly, he never played football again. See August 1882 for more details on the Tankard-Coulthard affair. We have received a letter from Mr. George Coulthard anent this matter, in which he claims to have kicked the greatest number of goals on one season, the number being 27 (22 for the Carlton club and five in the inter-colonial matches) in the year 1879. On reference, however, to the Footballer for that year, as well as to our own records we find that he is only credited with 24, 21 of them being kicked for Carlton and three in the inter-colonial contests. Our figures published on this subject a few weeks ago had only reference to club matches, which furnish the most equitable comparison. In 1883, George Coulthard was struck down by tuberculosis, a killer disease that was sweeping through the colony. He died later that year, aged just 27. George's younger brother William played for the Carlton Second Twenty and later served on the Carlton committee. He named his son George after his late brother. Coulthard.- On the 22nd. inst, at 233 Lygon Street, Carlton, George Coulthard, aged 27 years. Much respected by all who knew him. The funeral procession left from his home in Lygon Street to the Melbourne General Cemetery. Members of the Carlton Football Club are invited to attend the funeral of the late GEORGE COULTHARD. The procession will move from his late residence, 238 Lygon-street, Carlton at 4.15 TODAY. M. B. Hearne, Hon Sec. "A very large number of persons (says The Age of October 25) followed the remains of the late George Coulthard to the grave yesterday afternoon. Mr. Coulthard who was only a young man, was well known in football and cricket circles, and was greatly esteemed and liked by all who knew him. As a footballer he was one of the best players in the Colony, and was for several seasons captain of the Carlton Football Club, whom he often led to victory. He was also an ardent cricketer, and on several occasions worthily represented the Colony in intercolonial and international matches. He was for a time engaged by the M. C. C. as a professional bowler. A large number of those present at the funeral were members of the various cricket and football clubs." The Otago Daily Times (N.Z.) November 7, 1883. George Coulthard was one of a select band who both played in and umpired Test cricket, having stood in 2 tests prior to his selection as a player. George Coulthard, Carlton vs Geelong at the East Melbourne C. G. 17 July 1880. Australian Pictorial Weekly, July 24 1880. About twenty-four years of age, weighs 12 stone, is 5ft. 10 ins. in height, of Victorian birth, and for a physique as fine a specimen of a colonial as one could wish to see. For the past five years his name has been very prominent among footballers, and for playing the game in it's most perfect style we would have much difficulty in finding his equal; he marks with certainty, and kicks "punt" or "drop" with admirable judgment and accuracy; is very dangerous when near his opponents' goal, seeming rather to prefer acute angles. During last season he kicked twenty-one goals for the Carlton Club.... His fellow players show their confidence by always playing to him when possible....His speciality is, undoubtedly, running with the ball; many are the runs he has made, warding off his opponents with long muscular arms. This peculiar style of passing is really a treat to witness, and we may well say that Coulthard is unequalled at it, being a custom almost his own. Jack Worrall writing in the Australasian September 13 1919 about school boy football in Sydney, mentions that George Coulthard played Rugby for a while when living in Sydney. 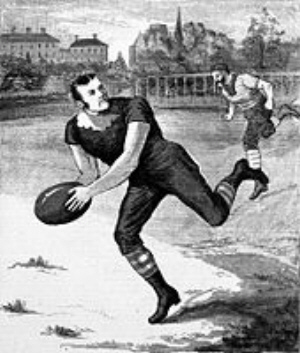 "That such a contention is correct was proved many years ago by the old-time champion, George Coulthard, who, when resident in Sydney, became in one season the crack Rugby player of the State, his Victorian habit of kicking running goals from the field being undreamt of previously, and considered rank heresy." The article mentions that boys who play Australian Football at school in Sydney go on to make fine Rugby players, but Rugby players never succeed at the Australian game. First central umpire to appear in all white uniform was Mr.George Coulthard, who officiated as central umpire in the match between Melbourne and Norwood (S.A.) at the M.C.G. in 1877. "CHAMPION OLD TIMER - Coulthard of Carlton"
"Old Boy" of The Argus August 12 (p12) wrote about the best past players and quotes from "The Footballer". George Coulthard (Carlton) - "Forward, back, or following, he combines all the requisites that go to make up a first class player - and has justly earned the distinction of being one of the finest in the colony. Possessed of wonderful endurance and is withal a fine-tempered player." The Referee August 03 1933 had an article on the history of the game. The writer J. C. Davis also talks about George Coulthard's trips to Sydney. "At the time of the Carlton v Waratah George Coulthard, a famous Carltonian, was bought to Sydney to coach the players. But George, somehow, did not find his sojourns in Sydney anything but tempestuous. He was the cricket umpire whose run-out decision against W. L. Murdoch in the match between Lord Harris' team and N. S. Wales led to tumult with the spectators in torrid moments swarming over the fences into the field of play. On his visit to coach the Sydney footballers George was inveigled on a boating excursion on the harbor. This can be a very fascinating experience on a bright day. This day, they say, was bright, with the sky and the reflecting waters a bright blue. You know what kind of days those are on Sydney Harbor. Nothing in the Pacific, or any other seas, can surpass them in charm for the man seeking, sport and pleasure. All was going serenely. The boat was going along gaily with George seated on the stern drinking in the fresh sea breeze and dwelling on the beauties of the harbor. Suddenly he disappeared overboard. His coat tails hanging over the edge of the boat were spotted by an inquisitive shark. Scenting something choice the shark grabbed the coat and tugged. As George was inside the coat, he went with it. The shark took a good mouthful of coat and decamped, leaving George struggling in the water. His companions helped him out. But the shock was enough for the gallant Carltonian, so they say, for he was soon travelling back to Melbourne." A football veteran names George Coulthard as the best player he has seen. "SOME MORE GIANTS OF THE PAST"
A reader writes to the Daily News to scotch claims that Albert Thurgood was the best footballer ever seen. "FOOTBALLERS OF OTHER DAYS - PROWESS OF GEORGE COULTHARD." "IN THE DAYS OF BEARDED 'BALLERS." about the early days of the Carlton Football Club and George Coulthard. Coulthard played one Test Match for Australia. Australia vs England Sydney Feb.17-21 1882. 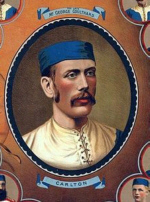 George Coulthard also umpired in two Test matches 1879 and 1882. Coulthard played as a professional cricketer for the Melbourne Cricket Club. Apart from George Coulthard, Tom Kendall and Harry F. Boyle are other Carlton Football Club players to have played Test Cricket for Australia. Jack Conway was an Australian Cricket Team manager. V.F.L. Carlton Coach Jack Worrall played Test Cricket for Australia. Contributors to this page: blueycarlton , pblue , molsey , Jarusa , kkk and PatsFitztrick . Page last modified on Sunday 28 of January, 2018 10:49:21 AEDT by blueycarlton. 1995 - Blues Rollercoaster ride continues (June 95).